Dehydrated foods can be convenient staples or emergency supplies to keep in your home. You can store many kinds of dried food, such as beans, fruits and meats, at room temperature without worrying about them spoiling or losing quality. However, dehydrated foods have different properties than fresh ones, and they can be less healthy or more cumbersome to use. Because dehydration is a process that removes water, dehydrated foods are higher in calories per ounce than their fresh counterparts. The lighter weight of dried fruit, for example, can make it easier to carry on hikes than fresh fruit, but eating too much dried fruit can lead to weight gain because of its higher calorie content than fresh fruit. 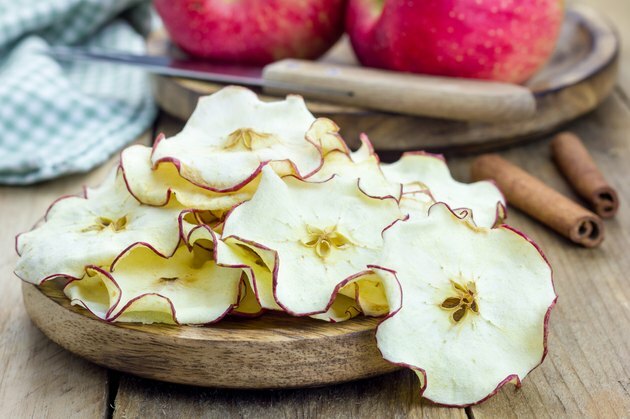 A cup of fresh apple slices weighs 4 ounces and contains 57 calories, while a cup of dehydrated apples weighs 1 ounce and contains 208 calories. Dehydrated foods may contain sugar to add flavor or act as a preservative, and sugar adds extra calories without providing additional essential nutrients. A cup of fresh blueberries weighs 5 ounces and contains 84 calories and 15 grams of sugars from natural sources, while 1/4 cup of dried, sweetened blueberries weighs 1.4 ounces and contains 127 calories and 27 grams of sugars. Select fresh fruit or choose unsweetened varieties of dried fruit to limit your sugar consumption. Salt is another common preservative in dehydrated foods, and a high-sodium diet can lead to hypertension and coronary heart disease. While most kinds of meat are naturally low in sodium, dried meats, such as dried salami and cured beef, are typically high-sodium. The daily recommended sodium intake for healthy adults is a maximum of 2,300 milligrams; an ounce of cured, dried beef contains more than 780 milligrams of sodium. Read the list of ingredients to avoid dehydrated foods that contain salt. Dehydrated food can be convenient because you can stock up on it ahead of time, but it can take longer to prepare than fresh or canned foods. You need to reconstitute dried milk powder in water before you can drink it, and you may need to boil dried beans for hours or soak them overnight before you can eat them. If you are drying meat, be sure to use protocols that the U.S. Department of Agriculture recommends to lower your risk of foodborne illness.